On February 26, 2009, a tragedy struck the Athens music world and beyond: 53-year-old guitarist Randy Bewley of Pylon died of a heart attack. In the last few years, the legendary band had reunited for the 2nd time, touring and prepping new material. 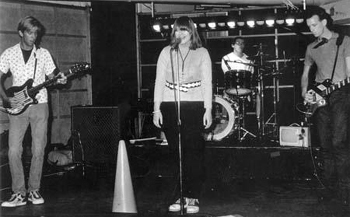 For more about Pylon and its history, see our 1998 interviews with the rest of the band. After giving them some space to deal with the horrible loss, I approached the rest of the group in May 2009, asking if they'd speak about Randy. Bassist Michael Lahowski and singer Vanessa Hay were kind enough to reply and share their thoughts about him. Adding to the already somber circumstances, Hay also confirmed what seemed obvious- without Bewley, Pylon was officially over. I met Randy in art school. I'm not sure when or where, but my best guess is that it was when he had a job washing the photo prints for the beginning pin hole photography class students. For sure, we were friends in my second year of college when I was living in the dorms. I'm sure that he impressed me by his gentleness, his intelligence, his demeanor and openness, and our shared body type (tall, thin, long hair) -- although in his case, (it was) elevated by his beauty and style. The next fall, I rented a single room in a house where I shared a bathroom and a kitchen, then moved into another house with 3 friends that spring. Randy and I maintained some form of contact and friendship during that year, but I can't remember the details. But the following fall, Randy and I moved into the upstairs of the house where I had lived before (that) and shared that kitchen. We never locked the door. We merged our record collections. Our rent was about $125/month. We threw lots of parties in the huge abandoned yard adjacent to the back of the property, which became known later as Pylon Park. Randy was a sculpture student and was denied in his effort to move over to photography, so he would ask me to conduct photo critiques of his Polaroids on our kitchen table on Barber Street. I still have that table and continue to hold his gentle request for me to judge his photos as a key indicator of the deep mutual respect and creative openness that we shared. While we were living there, we started what became Pylon. It was Randy's idea and he pushed it a bit, as I was reluctant -- saying that it was too late to start a band, we'd look like Johnny-come-lately's. There were so many ingenious records coming out, I thought it was already being done. He continued to persuade me; I think I was hedging for fear I wouldn't be able to figure out an instrument, since neither of us knew how to play anything. Randy guided me by encouraging me to listen to favorite records, and to tease out the various instruments, and to see if there was one that appealed to me in my gut. It was the bass. Plus, I thought it would be easier to play since there were only four strings. Randy found me a bass somewhere- I think (at) a pawn shop. We'd run our guitars through our stereos and started jamming in the apartment after a short-lived period where he tried to play drums instead of guitar. I'm not sure where the drums came from, but we realized we couldn't really generate a "song" that way, so he picked up the guitar. I don't know how much time we put into all that; I have a bunch of cassettes that we taped our endless riffing with, and intend to listen to some of those. I know we were doing lots of art and going to lots of parties. We encouraged each other in art, trying disciplines that we weren't supposed to be in, such as my tutoring of him in photography, and me straying into 3-dimensional work with assembled installation pieces, which he was already doing. Both of us were accepted into a juried sculpture show with our assemblies of plastic, inflatables and other ready-made objects and common materials. Our inclusion was an outrage to the sculpture department who mostly worked by chiseling stone, carving wood, and casting metal. Those forays of ours were essential lessons, informing our move into music-making, which was also inspired by the obviously naive B-52's. When we moved our music-making from our apartment to my downtown art studio, the project grew beyond me and Randy. Randy remained my roommate in the beginning months or years of Pylon, only moving out when he got married. Those years were special times for us, until last year (2008) when our friendship began to resemble that feeling again. We really did come full circle. PSF: Talk about when you first met Randy. I can't tell you when I met Randy, but I know that I first met his roommate Michael Lachowski- during an independent study art class taught by Bob Croker. Our class would have critique on Wednesday afternoon which was usually followed by a trip to whatever place had the cheapest pitchers of beer. We would talk, drink beer, talk. Then our group would sometimes head over to the late night disco at Episode 241. From midnight until closing at 1AM, the DJ played "new wave" along with stuff like "Flashlight" by Parliament. We would all dance together as a group and that's where I became aware what a good dancer that Michael was and is. I am convinced that the first conversation that I had with Randy was at a Waffle House late at night after one of these art school outings. I had ordered the cheapest thing on the menu: one scrambled egg which came with a piece of toast and grits and some coffee. I'm pretty sure that my bill was less than a dollar. He was impressed that I was able to get something for that and we talked. After that, we would talk at parties about what music we liked to hear, guitars, that kind of thing. Randy was usually a quiet person, but he was also very witty and right on the money with his statements and thoughts. His laugh seemed to come out of nowhere-abruptly. It was infectious. PSF: How did Randy contribute to the formation of the band? Vanessa: Randy was, as Michael has put it, "the instigator." There would not have been a Pylon without Randy. He found the instruments for Michael and he to practice on. He asked me to audition as the singer. I wasn't a singer, but I was a friend of both of them at the University of Georgia art school. He saw something in me that I really didn't know was there. When it was time to break up, he was the one who instigated that too. PSF: What do you think he brought to the group? It's one of those things that is difficult to explain. We all had too much fun together. After working with some other people, I realize that it is more common to discuss what you are going to do first. Pylon eventually developed some type of a psychic connection and we would just play until we had something. No one else really ever told the other person what to play or do. Amazing, really. Randy was usually very quiet and he could be moody at times. He was also very funny. Extremely funny. I still laugh out loud at some of the things that he said or did. Actually, the whole band had an incredible sense of humor. Randy had an amazing laugh that would just all of a sudden come out of nowhere. He was a completely original guitarist. At our first practices together, he was attempting to tune the guitar and I think that I said, "Well just tune it to what you think it's supposed to sound like." He came up with this amazing tuning that really contributed to the entire band sound and it's brilliant too from what I understand after speaking with some other musicians. You can still play "regular" chords and such. He made up all of his own chords, parts, etc.. As Curtis said, "Some bands had groupies that followed them. We had guitar nerds." He was a natural. It is impossible to tell you how much I miss him and I don't know if I will ever not. PSF: How was Randy involved in the songwriting process? In the beginning of Pylon, there was Randy and Michael jamming together. Making sounds and figuring it out. Curtis brought his drums in shortly after knocking on the door to ask if they needed a drummer. Curtis was their upstairs landlord and could hear them through the floor droning the same riffs over and over. When I came into the band, I merely tried to make words that Michael had written fit the music. As time went on, we became a collaborative 4-piece unit with everyone contributing their own parts. Randy was involved in the whole songwriting process from the beginning and through all the stages of the development of the band. Through the first 2 stages of the band (1978-1983 & 1989-1991), we had the luxury of having a practice space where there was no time constraint and we practiced together on a regular basis. The last time Pylon reunited (2004), we were using a rental space by the hour and it did cramp our style having the clock tick and a limitation on how long we could be there. Randy had plans right before his death of changing that. He had recently moved into another space and had set up a room where he and Michael could jam together without constraint and bring some new sounds into practice to instigate the writing of new material. He thought that we would take it back to square one of how the band had originally written songs. Michael never actually saw the room before Randy passed, but Randy had shown it to me. He had a happy gleam in his eye as he pointed where he and Michael would sit. He had brought in a practice amp for Michael, so that he wouldn't have to lug his big amp around. PSF: When you think of Randy's guitar playing, what comes to mind? An expressionist painter. His sound could be jagged and spontaneous, but it could also be very beautiful and lush. He was a part of the whole picture and not a soloist. He was very integral to our sound and is not replaceable. PSF: What kind of special qualities did he bring to a live Pylon show? Randy was very focused and was very confident on stage. He was able to play the part that he had written, but also improvise. "Danger" is an example of a song that I don't think that he ever played exactly the same way live. PSF: Why did he leave the band? I don't know his thoughts exactly. It was a mutual decision the first time that we broke up (1983). Randy was starting a family. I know he wanted to be there for them while they were babies. He was an excellent father to his boys. He built them tree houses, skateboard ramps and played with them. Later, after we had broken up the second time, he finished his degree in Art Ed and was an elementary school art teacher. An excellent one too, I hear from his former students. PSF: When you had the 1st reunion in the late 80's, did you see anything different about Randy in terms of how he played, wrote or worked within the band? He had a family and that affected everything. I had one too and it affected everything for me as well. We both had small children. I believe his sons were 4 and 6 and my daughter Hannah was 2 or 3 or so when we got back together for the first reunion. Our spouses were pretty supportive or we would not have been able to do it at all. I think that we were all more serious and business-like about the business aspect of the band. It was still a lot of fun to write and to tour. PSF: What was Randy doing between the 2nd time the band drifted apart and the last reunion? Were you in touch with him much then? He went back to school and got his certification to teach art and taught elementary school art. I didn't see him a lot but I did have contact with him. He was a student teacher for my daughter Hana's 3rd grade class. Our children are about the same ages, but he has boys and I have girls and they attended different schools. We were busy leading our lives, working and raising children. We may as well have been living in different towns, except we did see each other from time to time. PSF: When you had the last Pylon reunion, how did Randy feel about the band and playing again? Randy was very happy to be playing again. He was interested in working on new material and working toward that direction. He really didn't want to play the 40 Watt (Club) again until we had some new material. PSF: Where there plans for new material? I think that I said earlier that he had just moved to a new place and set up a music room and had planned to get together with Michael in there and go back to how Pylon wrote in the very beginning. PSF: What do you think you miss the most about Randy? In addition, Vanessa was kind enough to provide this timeline of the band, including their first three years. Fall- Randy has idea to start band-equipment obtained (guitar $1 at Fleamarket, bass $35 at Pawnshop). Michael and Randy start to practice at Barber St. They move to Michael's studio and continue practicing. Curtis overhears them and offers to play w/ them. August 21- The Rat, Boston, MA "